A court orders a business valuation in a matter involving an oppressed shareholder claim. The appraiser, carefully applying the standards of his profession, sends an engagement letter describing a fair market value determination. The appraisal will value the enterprise as a whole, then apply minority and marketability discounts. The selling shareholder is going to argue for discounts – they always do – but the report will have all the information necessary for a determination either way. For the minority shareholder, this can be a trap. And it may be the wrong move to wait for the trial to fight out the discount issue and the battle over the definition of fair value should be fought as early in the case as possible. Here are a few reasons why. The appraiser is going to prepare a report based on the standards of the valuation industry and that standard is fair market value – what a willing buyer would pay a willing seller. He is going to try to avoid the tough issue of whether any discounts should apply. The AICPA’s Statement on Standards for Valuation Services No. 1 relegates the definition of “fair value” to a single paragraph in an appendix as a matter determined by state law in judicial proceedings. 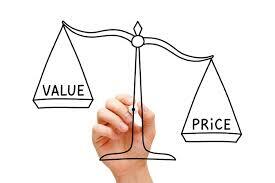 While fair value can mean anything that the circumstances dictate, New Jersey courts will usually, but not always, interpret fair value as simply the seller’s proportionate share of the value of the whole. In other words, no discounts. The professional appraiser, however, will make a thorough analysis of the amounts of a minority – lack of control – and marketability – lack of a public market – for the different interests, but will not probe to whether the application of discounts creates a windfall for either party unless told to do so by the court. And in the real world, once all of that work is placed in a professionally bound volume with charts and statistics, it is harder to argue that it should be ignored. Minority and control discounts, however, are reserved for the extraordinary case in which they are necessary to prevent an unfair result. The presumption should be that the selling shareholder gets his or her proportionate share of the full value of the enterprise. An opinion from the court-ordered expert that there is no economic unfairness in that result is going to carry a great deal of weight in the ordinary case. There is no reason to wait for the eve of trial to go through the exercise of establishing that fair value does not require any discounts to the minority’s interest. The seller is going to become fixed on the small number once it has been written down, making it all that much harder to resolve the case without a trial. Unless, of course, you’re the seller. In which case, I would just sit tight. Maybe no one will notice.